JAMIE Oliver's forthcoming Greenwich restaurant will include a new deli when it opens early next year. Plans have been submitted to Greenwich Council for alterations to the Grade-II listed Bar Du Musee to turn it into the latest branch of Essex-born chef's chain, Jamie's Italian. The application envisages "internal alterations to facilitate Restaurant with Deli at No. 17 [Nelson Road]." 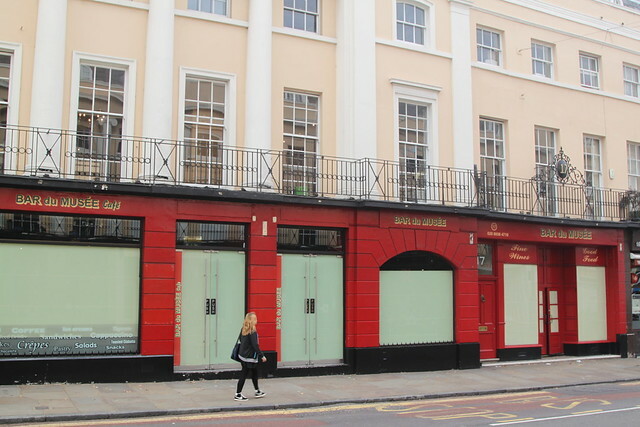 The entrance to the new restaurant would be at 19 Nelson Road, which has been the cafe area of Bar Du Musee and was formerly called George of Greenwich. The arrival of Jamie Oliver's Italian chain to Greenwich town centre was confirmed last month by Greenwich Hospital's Property Manager, Gilly Bexson. A GREENWICH restaurant with a history that stretches back to the 1960s has closed today. Bar du Musee in Nelson Road started life as a small wine bar and was the first venue in the town centre to come under the ownership of Greenwich Inc. The bar grew in size to include a cafe area, large restaurant area and also a covered garden space. The large venue in a prime town centre location has apparently caught the attention of Jamie Oliver and a long-rumoured move by his Jamie's Italian chain was confirmed in the latest edition of landlord Greenwich Hospital's own magazine. "A new arrival, timed for early next year," writes Greenwich Hospital's Property Manager Gillie Bexson, "is Jamie Oliver's Jamie's Italian on the Bar du Musee site. This relaxed and affordable dining... will be popular with locals and visitors alike." Greenwich Inc owner Frank Dowling recently spoke to Greenwich.co.uk and said his future plans included investing heavily in the Trafalgar Tavern to deliver 15 hotel rooms and renovating the entire building, building a new hotel at the site of Trident Hall and developing a music theme at the Admiral Hardy. In addition Inc Bar will be re-launched as a "classy cocktail bar." Greenwich.co.uk also understands the Bar du Musee name may be revived at another Greenwich venue in the future. Another Nelson Road has also closed. Italian restaurant La Cucina di Soteri, at the corner of Nelson Road and King William Walk suddenly closed for business just days afte Bar du Musee. The owner told Greenwich.co.uk that the premises had been sold back to the landlord, Greenwich Hospital. 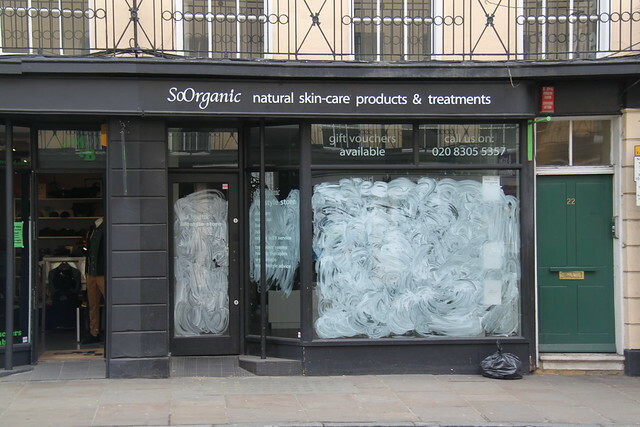 A SHOP in Greenwich town centre that specialises in organic skincare products has closed down. So Organic in Nelson Road shut its doors at the weekend and the owners plan to reopen the shop in Lincoln instead. 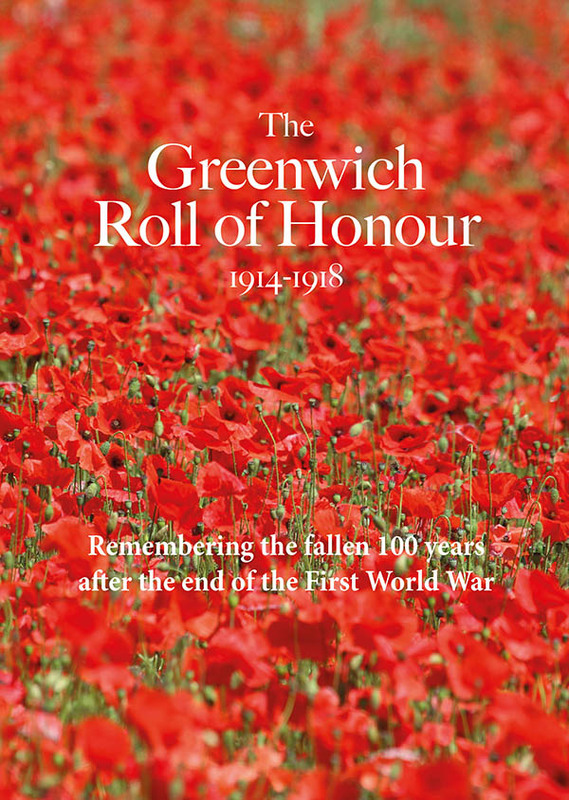 Chief Operating Officer, Stuart Burlton, told Greenwich.co.uk that the closure was because of the "reduction in customer footfall in the area, and the knock on effect this has had on retail sales." He added, "We leave behind a group of excellent and loyal employees, a beautiful shop, loyal customer base and, to be fair, a supportive landlord in Greenwich Hospital." The increase in the cost of parking in Greenwich town centre is one factor that So Organic's owners believe has put shoppers off visiting Greenwich. Customers with treatment room vouchers will receive a refund on application, either in full or in part if bought as part of a series of vouchers, depending on how many they had used as a proportion of the overall. Customers will also have the choice to exchange them for product vouchers on So Organic's website, which continues to trade as normal. Previously on this spot stood John Humphries House, now demolished as part of the University of Greenwich's development of the site. 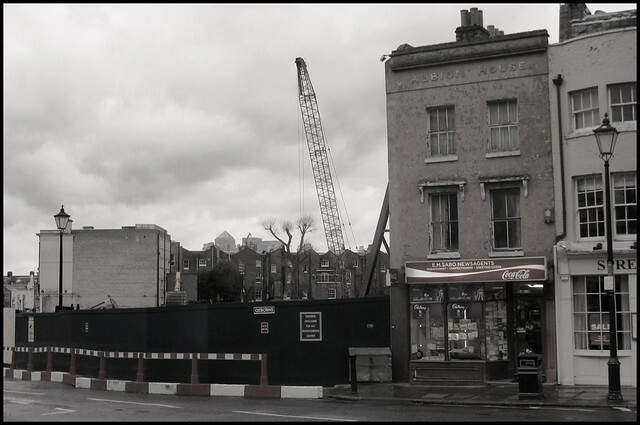 With the 1960s office building gone, you can now see the back of properties in Nelson Road and the top of the Canary Wharf skyscape from the corner of Burney Street. A planning application has been submitted to the council for a new boutique hotel in the heart of Greenwich town centre. The Greenwich Town House Hotel would be a high end 21-suite hotel above Bar du Musée in Nelson Road. Businessman Frank Dowling is behind the application and tells Greenwich.co.uk he is in "final negotiations" with a specialist boutique hotel operator. The hotel will occupy the upper floors of 17-21 Nelson Road, a Grade-II listed terrace designed by Joseph Kay. No external structural work is required for the conversion and following a refit, the new hotel could be open as early as February 2012. Bar du Musée, the first business bought in Greenwich by Dowling, will be incorporated as an upmarket restaurant within the new five star hotel. But with the landowner, Greenwich Hospital Estate, having permission to build its own 100-bed boutique hotel across the road at Greenwich Market, and following news that a large boutique hotel was recently approved in Catherine Grove, are they worried about about the continued viability of their own scheme? Edward Dolby, Resources Manager at Greenwich Hospital, tells Greenwich.co.uk that they have "no planning grounds on which to object to this scheme" and they believe there "will be sufficient demand" for their own boutique hotel which is due to completed by the end of 2014. Greenwich.co.uk understands a firm commitment has already been made by a national equestrian federation to book out the Greenwich Town House Hotel in its entirety during next summer's Olympics. A sushi restaurant in Greenwich was temporarily closed last week after an unannounced check up by Council environmental officers. Itoshii in Nelson Road was forced to stop trading on Tuesday after the Council went to court to get an emergency prohibition order issued. Council staff visited the business to check if improvements required after a visit a month earlier had been carried out. Instead they discovered evidence of extensive rodent infestations. There was evidence of mice and rats found in the storeroom, kitchen and even inside the wok burner cooker. There were large holes in the walls that allowed pests easy access to the restaurant and the general cleanliness of the premises was below standard. Work was undertaken by the owners and the restaurant was allowed to reopen for business last Friday. A five month project by Scottish Gas Networks to replace old gas mains in Greenwich town centre will begin on July 1st. The utility company is spending £270,000 replacing metallic mains with new plastic piping that should last for a minimum of 80 years. The works are taking place in Trafalgar Road, Romney Road and Nelson road, and require road closures during the replacement programme. Phase One: Work taking place in Greenwich Church Street, from number 8, along Nelson Road to just past the junction between Romney Road and King William Walk. Starting 1 July, for approximately 12 weeks, a series of diversions will be in place to enable the safe laying of a new main in an open trench. 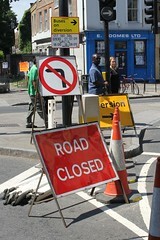 From 1 July, for approximately five weeks, the left turn from Nelson Road into Greenwich Church Street will be closed. Traffic will be diverted via Creek Road and Norman Road to Greenwich High Road, where motorists will continue along their intended route. In addition, westbound buses on routes 177, 180 and 386 towards Greenwich South Street will also divert via Creek Road, Norman Road and Greenwich High Road to Greenwich South Street. Buses on route 199 coming from Surrey Quays will turn right from Creek Road into Norman Road and Greenwich High Road to Greenwich South Street. The remainder of phase one will see the reinstatement of the left turn out of Nelson Road and two-way temporary traffic lights installed in Romney Road and King William Walk. Phase Two: Work taking place along Romney Road to the junction of Trafalgar Road and Eastney Street. From 24 September, for approximately nine weeks, the bus lane will be closed but two-way traffic will be maintained. Phase Three: Work taking place along Trafalgar Road from the Eastney Street junction to the junction with Hoskins Street. From 26 November, for approximately four weeks, temporary two-way traffic lights will be in place. Maze Hill will also be temporarily closed during this phase with diversions in place. SGN Team Manager Gareth Lewis said: “We’ve been working closely with the Greenwich Council and the emergency services to find the most effective way to minimise overall disruption while carrying out this essential work. Advance warning and diversion signs will be in place throughout the course of our work and access to homes and businesses will be maintained". AFTER my last week's moan about Nelson Road, I thought I'd say something nice about Greenwich shops for a change. To adapt the title of that bestselling book - is it just me, or are some things not quite as s--t as they were? Books, we've even got a shop selling them now. New ones. We've got an M&S. We've got a fishmonger, tucked away down Circus Street. We've got a decent independent wine merchant, in Trafalgar Road. And over the last couple of years, Greenwich, a place where the pinnacle of cosmopolitan eating was once the red Peperami, seems to have got itself several rather nice-looking bakery/ delis. Well, all right, they're not all strictly delis, they're deli-ish - but look, I'm calling them that so we can headline this piece "Duel Of The Delis." Alliteration, right? We hacks love alliteration. They might not all be delis, but there certainly could be a bit of a duel because over the last three years or so a comparatively small area, West Greenwich, has gone from no deli-type places at all to four. They keep opening more of the things. Earlier this week, I took the carrot cake challenge. I started with the oldest of the new places, what was once the "George" cafe/deli in Nelson Road, now more cafe than deli and rebranded as the Cafe du Musee. It's joined to two other "Musee" shops, including the original bar, and it's part of Frank Dowling's Inc empire, of which I've not always been the topmost fan. As I was standing there, making some notes about the furnishings, Frank himself, who I've never actually met before, suddenly came through the door specially to shake my hand (this sort of thing doesn't happen as often as I'd like, by the way.) Had he spotted me on CCTV? Is he having me followed? "Be nice, we're trying," he said, before leaving just as quickly as he'd come. You know what, Frank, I will be nice. Your shop was just a smidgeon clinical, with its black slate floor and its chandeliers - though it does have a nice grandfather clock - but actually, your carrot cake was pretty damn good, moist, generously-sized, worth the £3.25, I thought. So no green inc from me about you this time. Then it was round the corner to Rhodes, the rather stylish new bakers (est 2008) opposite the entrance to the naval college (don't think it's any relation to the celebrity chef Gary, which is probably just as well.) The window is stacked with shelves of cakes but the price tickets are strategically turned away from the street. If you saw them from the outside (£2.20 for a baguette) you might never cross the threshhold. And that would be a mistake, because this is an attractive place, with friendly service, better than the Musee, some of it with a calm North American accent. They're attentive, they approach you - although once I'd ordered and they'd put it at the till, they wandered off, leaving me a bit stuck when I wanted something else. They didn't have any carrot cake when I went in, so I got a sort of fruit Danish, which was good and light and had quite a decent collection of fruit in the middle Unfortunately the other thing I chose, the ham and cheese croissant, was duff: tasteless cheese, rubbery at the edges. On the admirable Greenwich Phantom blog, Rhodes is accused of charging 70p for a scrape of butter - "which was actually margarine" - to put on an 80p scone. Didn't check it myself, but if true, remarkably bad form, guys. Prices and consistency are the issues here. Next stop the Nevada Street Deli, in what used to be the Spread Eagle second-hand bookshop. I miss those floors of old paperbacks, stretching away like Gormenghast, but if it had to go, this is a good replacement. "Poilane delivered every Saturday," says a little blackboard in the window. I had a tasty sausage roll and anchovies on bread - they do light meals too - and I was well served, though gently ticked off for eating my Rhodes fruit tart thingy on the premises. This is easily the nicest place to sit in of the four, though alas there are only two full-sized inside tables, plus a further three seats perched in the window. The reason I'd never been in before was I'd never seen a table free before. Finally, the Buenos Aires, tucked away down non-touristy Royal Hill with, I think, the best food of the bunch. It's Argentinian, you might guess, but not perhaps quite as Argentinian as you might hope. 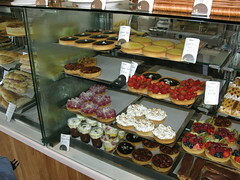 The Argie pastries are fab but the savouries are a bit more Med than Latin America. Lots of my neighbours love the squashy leather sofas, but I have bad memories of trying not to spill hazardous hot drinks while sinking into them. In all of these places you can, if I'm honest, get that slight, rather SE10, sense that they're good without being absolutely outstanding. The long-established Italian deli in East Greenwich - which was closing, but may now not be - remains the local standard to beat for quality and variety. But with the arrival, now, of four newish places doing similar things, the magic of competition may raise everyone's game. In the tough times ahead, they all deserve to survive. Let's hope they all do.